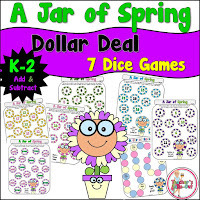 A Jar of Spring has 7 math games. These math games sharpen addition and subtraction skills. •Game 1: Add 2 dice for a sum. •Game 2: Add 2 dice for a sum and add 10 more. •Game 3: Add 2 dice for a sum and subtract 2 from the sum. •Game 4: Add 2 dice for a sum, add 10 more, and subtract 1. •Game 5: Roll 3 dice for a sum. •Game 6: Roll 2 dice and cover if the sum is odd or even. •Game 7: Roll 2 dice and highest (or lowest) sum advances forward. This Dollar Deal is only available right here on Teacher's Take-Out. Just click below to add it to your cart. Here are the same games with a winter theme. These Jar of Winter Games are also included as a Dollar Deal! Just click the picture on the left to read more about it.